Fort Worth, Texas, where some of the world's greatest horsemen and women meet for two days of Colt Starting and Horsemanship under the watchful expert eye of Ray Hunt. But most of all, they've come to pay tribute to Tom Dorrance, the legendary man who changed the way the human relates to the horse, somewhat to the benefit of the human, but greatly to the benefit of the horse. 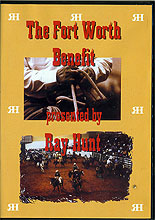 This DVD captures the excitement, the humor, the fun, and most of all, the dedication to the horse and to giving him the best deal possible. Mornings are for Colt Starting. The Clinicians randomly draw for colts from four ranches, Hunt, 666, Pitchfork and Moorhouse. We follow the clinicians over two mornings as they catch the colts, work them on the ground, saddle them and - with Ray's insight and coaching - take that first all important ride. Afternoons are reserved for Horsemanship Class. Here we meet new participants, joining some of the clinicians from the Colt Starting class. Many have come with their own horses in tow, while others ride horses supplied for them. Since the horses have various levels of experience, the Horsemanship Classes are both insightful and exciting. Saturday Morning: Colt Starting in four round corrals. Saturday Morning: Colt Starting continues. Saturday Afternoon: Horsemanship class in the full arena. Sunday Morning: One round corral is set up in the middle of the arena as the Clinicians work with the same colts as Saturday morning. Sunday Morning: Colt Starting continues. Then a special sequence gives us unique insight into the way Ray works with his own horse. Sunday Afternoon: Horsemanship class in two sessions.